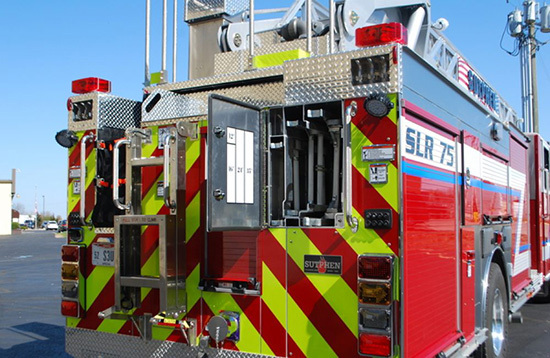 SUTPHEN SLR75 AERIAL LADDER - SOS Safety International Inc. 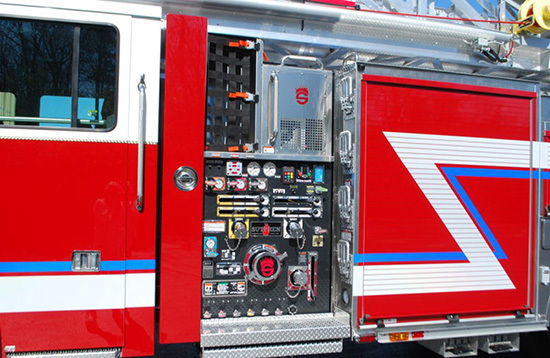 It is the rear-mount aerial ladder you’ve been waiting for. The Sutphen SLR 75 Rear-Mount Aerial Ladder. 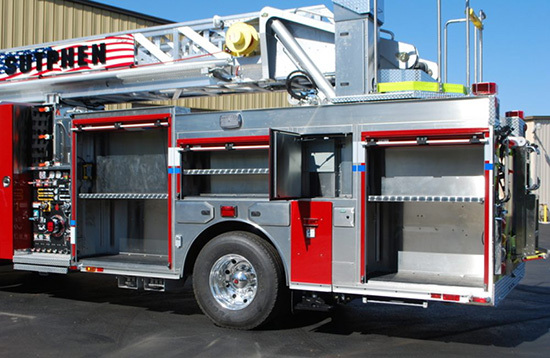 It’s the first in a new generation of Sutphen Aerials, and it’s everything you’ve come to expect from Sutphen. 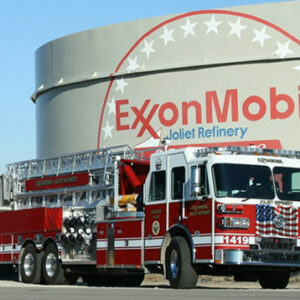 It is the rear-mount aerial ladder you’ve been waiting for. The Sutphen SLR 75 Rear-Mount Aerial Ladder. 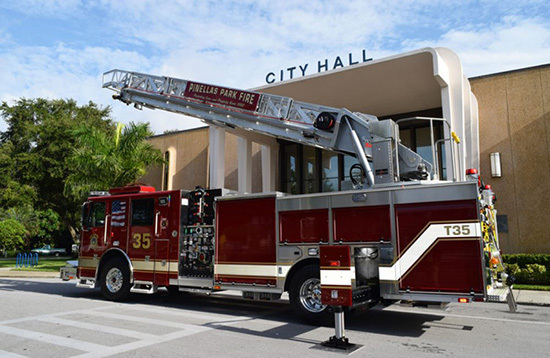 It’s the first in a new generation of Sutphen Aerials, and it’s everything you’ve come to expect from Sutphen. 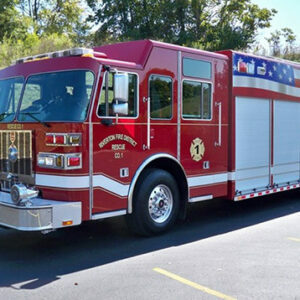 The new SLR 75 features a short maneuverable wheelbase, low overall travel height, pump options from 1500-2000 gpm, water tank capacity of 300-500 gallons, and over 200 cu. ft. of compartment space. 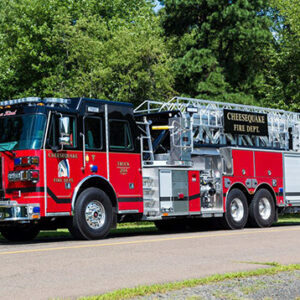 With functionality of a rescue pumper and the versatility of a ladder, the SLR 75 will be the workhorse of your fleet. Low overall travel height of 1′ 9″, and short overall length of 38′ 3″. Low, open hose bed for easy access and deployment/reloading of hose. Stabilizers are out and down “H” style with a set up width of 16′. The compact 3-section ladder measures in at 75′ of vertical reach and 65′ 11″ horizontal reach. The aerial is rated for #750 tip load dry and #500 while flowing with 100 pounds of equipment. The wind rating is for up to 50 mph gusts, and 30 mph sustained. Lighter Overall Weight: Sutphen Aerial Apparatus typically have an in service weight 10-20 Tons less than our competition. Don’t be mistaken though, lighter weight doesn’t mean lighter duty. What lighter weight does mean is better acceleration, better breaking with shorter stopping distance, and less wear and tear on your brakes and brake components which reduces maintenance costs. The Strongest Aerial Device in the Industry: Constructed using #6061-T6 aluminum alloy and fastened with aircraft grade HuckBolt technology, the aerial has a safety factor of 3:1, unmatched in the industry. The HuckBolt system eliminates the need for welds. Welding weakens the material, making it susceptible to cracking. 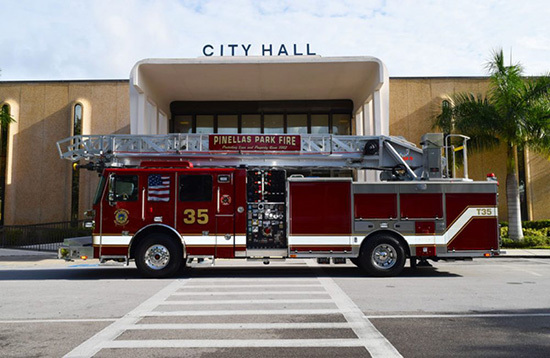 Fast and Easy Set Up: From the time you arrive on scene, the Sutphen Aerial can be set up and in the air in quickly. The fastest and most efficient set up time in the industry. All necessary control stations, eg: Cab, Jacks, Pump, and Turntable, are located within 6’ of each other. 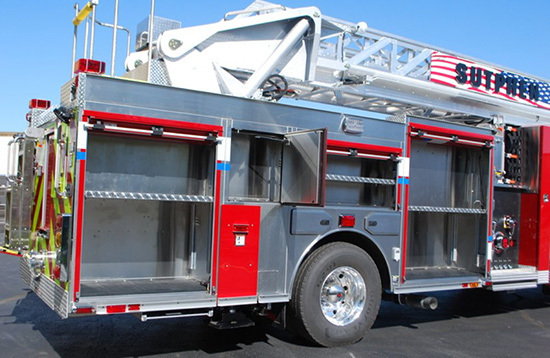 Heavy Duty Body: The Sutphen body is constructed from corrosion resistant #304 Stainless Steel. Body compartments are bolted together for strength and ease of repair. Body compartments are tall and deep providing ample storage space for rescue tools and other bulky equipment, as well as tool mounting boards, shelves, trays, etc. Heavy Duty Cab Interior: Cab interiors are well appointed and very durable. Stainless steel door panels are standard, and heavy duty Durawear material covers the headliner and back wall. Bostrom Secure-All ABTS SCBA seats Durawear covered seats are standard. Multiple Seating Configurations: Cab and interior configurations available to accommodate anywhere from 6 to 10 personnel all while still maintaining a “full tilt” cab. Rear Axle and Suspension 35,000 lbs.